This iconic image of ‘Spaceship Earth’ was created by a student at Llanfyllin High School during our One School One Planet teaching sessions. “One School One Planet Vol. 1: Climate. Education. 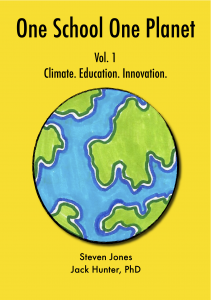 Innovation” and “One School One Planet Vol. 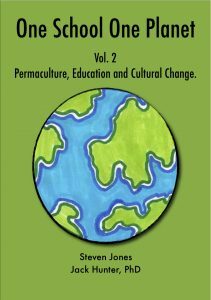 2: Permaculture, Education and Cultural Change” Edited by Steven Jones and Jack Hunter. Vol. 1 is a collection of essays and articles written over the course of the first year of the One School One Planet project (2016-17), for various newsletters, magazines and blogs. The book lays out some of the big ideas that underly our project, and tries to present them in accessible bite-sized chapters that can be read as a continuous narrative, or dipped into individually for snapshots of different ways of thinking. The chapters build up to the first trial sessions of our educational programme with students at Llanfyllin High School, and the book includes many examples of their writing and artwork. Vol. 2 consists of work completed over the second half of the project (2018-2019), including short articles and interviews with teachers interested in the role of permaculture in mainstream education. We hope that through presenting our work in this way we can encourage others to pursue similar goals in their own local area. The books also make excellent companion texts to accompany our schools programme. It is exciting to discover a Welsh community that has already done so much to pioneer…practical solutions using permaculture design…Prepare to be inspired. – Maddy Harland, editor of Permaculture Magazine. I encourage all of us to support this project and read this book. – Dr. Mark A. Schroll, author of Transpersonal Ecosophy Vol. 1. You can download One School One Planet Vol. 1 for free HERE. You can download One School One Planet Vol. 2 for free HERE. Alternatively you can pick one up from us at our events and activity days.